Analog Devices have released a next-generation accelerometer designed for long-period monitoring of the physical condition of high-value assets. 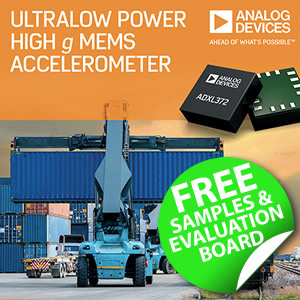 With its extremely low power capabilities, the ADXL372 micropower high-g MEMS accelerometer targets Internet of Things (IoT) solutions where shock and impact on a unit during storage, transit, or use would adversely affect its function, safety, or reliability. Typical target applications include materials inside shipping and storage containers, factory machinery, and battery powered products where there may be lengthy quiet periods punctuated by spontaneous, severe impacts.